The most healthful breakfast is whole grain cereal. If you're trying to lose weight, control cholesterol or diabetes, or just need a lot of energy, your best bet is a hot cooked cereal of whole grains, such as oat groats, barley or wheat berries, served like oatmeal - perhaps with cinnamon or raisins. Most of the prepared hot cereals such as oatmeal are made from whole grains and are just fine, too. Breads have been made for thousands of years, in virtually every culture, to wrap, sandwich, or accompany other foods for breakfast, lunch and dinner. When ground-up grains were used shortly after milling, there was no need to remove anything or to add ingredients to keep them fresh. Only in our recent history have we turned bread into junk food by removing the germ and fiber from the grains. 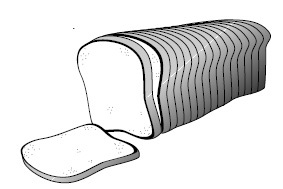 Even worse, some bread manufacturers add partially hydrogenated fats to their breads to prolong their shelf life. 1. Avoid any bread that is made with partially hydrogenated oils. Read the list of ingredients and if it contains the words partially hydrogenated, put it back on the shelf. Partially hydrogenated oils are totally unnecessary for making good-tasting bread, and we should boycott the companies that use them in their products until they get rid of them. 2. Get as much whole grain flour as possible. This isn't easy to tell, because regulations allow bread makers to use the words whole wheat even if portions of the grain have been removed. Words like stone ground, multi-grain, seven-grain or cracked wheat sound healthy but don't tell you anything. Generally, breads that list whole wheat as the first ingredient are better than those that start with enriched flour of some sort. 3. Pick breads with higher fiber content. Two grams of fiber per slice is better than one gram or zero grams. One caution: breads promoted for their fiber content may have added pea fiber or some such ingredient; that's adding sawdust, not an indication that you're getting the whole grains. Check the list of ingredients on these breads. 4. Added seeds are a bonus. Many breads include seeds in the dough or as toppings. This is an easy way to add caraway seeds, sesame seeds, poppy seeds or other whole seeds to your diet. 5. Breads made from 100% sprouted grains have all the nutrients of whole grains, may have more vitamins, and may raise blood sugar less than breads made with dry flour. 6. Watch out for breads that taste too good. Nothing is more seductive than a loaf of freshly baked bread. A reasonable portion is 1-2 slices. If you eat the whole loaf in one sitting, or the whole basket of rolls in a restaurant before dinner comes, you'll get into trouble.